Former drug user says big city drugs bring big city problems. Angie Pelphrey, administrator of Freedom Hall Recovery Center in Piketon, explained that a hot shot is a lethal dose of drugs given intentionally to kill someone. “We’ve been hearing a lot about hot shots now and so many people passing away so suddenly. It’s really scary,” she stated. Pelphrey introduced the Daily Times to Tim Petro, 43, who has been in recovery at Freedom Hall since January. Petro explained that he is originally from West Virginia but graduated from high school in Gallia County (Ohio) in 1992. The recovering addict explained that he started using drugs when he was 10. That is when he first tried alcohol, marijuana and nerve pills. By the time he was 13, Petro says he was using cocaine. Reflecting, Petro explained that his life took a dark turn fast. 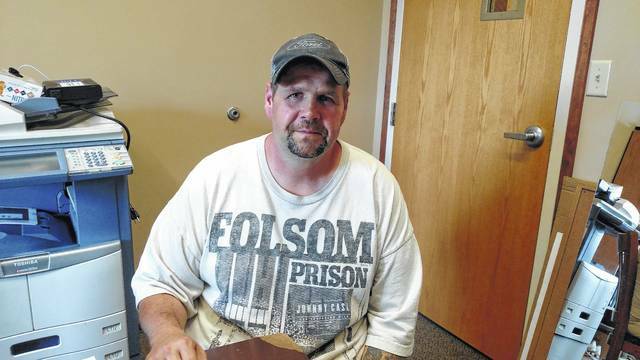 He soon turned to a life on the streets, where he says in stayed in homeless shelters, abandoned houses and cars except for times when he was in jail, prison or rehab. Petro explained that his first prison sentence came six months after he graduated high school. Prison and the streets became the only life he knew. “At one point in time, I considered myself half institutionalized,” he stated. Though he says cocaine was his drug of choice, Petro says in 2009 he got out of prison for the last time. Not long after he was released from prison, Petro says he started using opiates. This wasn’t his first experience with opiates, saying he had starting using opiates in the 90s when pill mills first started opening in Portsmouth and other parts of Appalachia. At that time, he says that OxyContin was still popular and accessible. He was using OxyContin and heroin, which was not as popular at that time. Petro says at this time, pill mills were still supplying communities with OxyContin. Meanwhile, as more and more pill mills started to close, heroin started coming from bigger communities. He stated that when he first started using heroin, he would have to go to a bigger city such as Columbus or Detroit, Mich., in order to get the drug. As demand increased, suppliers started bringing the drug into rural areas such as Southern Ohio. That is how Petro says he first learned of hot shots locally. He had only previously known of hot shots and a big city drug/gang activity. Petro explained that after the pill mills started closing, he was incarcerated with a guy from Gallipolis, who said that he was going to give a hot shot to a prostitute who had become a problem for him. Petro explained that hot shots are an assassination technique in which a person intentionally injects a person with enough drugs to kill them. They do so by targeting people who are already drug users. They then either preload a needle with enough heroin to kill the person, without the person knowing how much heroin they are being given. Or, the give the unsuspecting victim a drug such as Carfentanil in place of heroin. Carfentanil is 1000 times stronger than heroin. “With Carfentanil dope going around, you can take somebody who can take just regular dope and shoot half gram and gram shots, but can’t do but like a tenth or two-tenths without borderline falling out and getting narcarned and things at that point. They (a killer) can take a half gram of that or three-quarters of a gram and know it’s going to kill them (victim),” Petro explained. He added that usually the person giving the drugs earns the addict’s trust first or looks for the addict to be without drug and experiencing severe withdrawals. The former drug user stated that a person may even act like they are giving the victim a sample, letting them try some that they had already put in a syringe in order to complete the assassination. Petro added that hot shots are a way of getting rid of someone who may be a problem. As a result, Petro explained that it is accepted that people who snitch die, making it easy to not only find someone willing to give a hot shot but also making it hard to get people to talk about the issue. The Ohio Department of Health has released overdose data for 2016, which shows that the opioid epidemic is progressing, and the death toll is increasing. Scioto County continues to lead in overdoses, with an overdose rate of 34.1 annual deaths per 100,000 population. This translates into 35 overdose death in Scioto County in 2016, an increase from 30 in 2015 and 23 in 2014. 15 of the 88 counties in Ohio had an overdose rate higher than 28.4. The highest rate found in Ohio was found in Montgomery County, where the overdose rate was 42.5. Fentanyl and related drugs were involved in 58.2 percent (2,357) of all unintentional drug overdose deaths in 2016 in Ohio. With the emergence of Carfentanil in 2016, fentanyl-related overdoses accounted for 340 overdose deaths in Ohio, most of them during the second half of the year. Petro stated that issues affecting the drug culture affect everyone. “When OxyContin blew up, like I remember getting out of prison and taking Greyhounds to Philadelphia (Penn.) and getting right off on the corner and coping bundles of heroin and bringing it back here. We were looked down upon as just dirty. I remember reaching my arm out to pay for cigarettes at a convenient store, and the lady jumping back because she saw my track marks (injection scars),” Petro stated. However, he says after pill mills came about, the opiate problem spread to everyone. Everyone from church members to cheerleaders were becoming addicted, often due to a legitimate injury. Now, the opiate epidemic is widespread, as are the dangerous of the evolving drug culture.